Despite having little polar territory of its own, the US will use its close ties to Canada to secure a bigger slice of the Arctic’s vast natural resources, Michel Chossudovsky, director of the Centre for Research on Globalization, told RT. The battle for the oil and gas riches around the North Pole is heating up, with the eight Arctic Council nations – Canada, Denmark, Finland, Iceland, Norway, Russia, Sweden and the US – looking for a bigger piece of the pie. But even some countries with no territory in the region, such as China and India, have managed to achieve observer status in the Arctic Council. All of the Arctic Council states have sent delegations to the third International Arctic Forum, which kicked off in Russia’s Salekhard on September 24. The director of the Centre for Research on Globalization, Michel Chossudovsky, believes that the US will establish military bases and promote the interests of its companies in the Arctic to increase its influence in the region. RT: Just how hot could things get over the Arctic with so many nations vying to lay their hands on its estimated 20 plus percent of the world’s oil and gas? Michel Chossudovsky: We have to look at the issue of the claims, the territorial claims. The strategic interests are significant because it’s estimated that Arctic region has something in the order of 25 per cent of global oil and gas reserves. But we should understand that the US transpolar territory is much smaller than that of Russia, Canada and Denmark. And in fact the US doesn’t really have territories bordering, or very limited territories bordering the Arctic Ocean. And we have to distinguish between the territories above the Arctic Circle, which is the imaginary line at the 66th parallel, and the actual Arctic Ocean, and there what happens is we have Canada, Denmark and Russia, which are the main countries, which actually have territories there. How does the US get round this? It’s not a member of the UNCLOS, the UN Convention on the Law on the Sea, and therefore it can file official claims for extended continental shelf. And, in fact, I don’t think it intends to do that, because if you look at the geography Alaska is only a little bit above the Arctic Circle. But how does it get around — it is through the militarization of North America and its alliance, particularly with Canada, but also with Denmark and Norway. And the establishment of what is called ‘Maritime NORAD’. This goes back to 2002 when [US Secretary of Defense Donald] Rumsfeld, actually, claimed the whole region under the US Northern Command. RT: Moscow won’t be giving its slice of the pie to anyone, for sure. Earlier this month, President Putin ordered the rebuilding of a military base in the Novosibirsk Islands. How much of a player is Russia trying to be in the region? MC: I think Russia has legitimate claims to that area in view of its geography with a large portion of its territory above the Arctic Circle and territories within the Arctic Ocean itself. But the US is now building integration with Canada under the North American Union, which means to extend its so-called sovereignty over Canada’s Arctic territories. 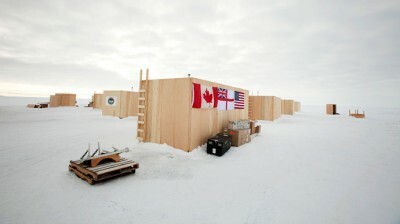 And under US Northern Command, of which Canada is unofficially a member, Canada accepts the right of US to deploy troops and naval forces extending into its Arctic territories. And so the issue of territorial rights over the Arctic will eventually, in my opinion, go through deep integration between Canada and the US and the so-called North American Union. And the strategic partnership, which eventually will extend its jurisdiction up onto the North Pole. That’s really the issue, it’s a confrontation between Russia and the US and its partners, NATO partners in a new battle for oil and gas. And there we’re talking about militarization, establishment of military bases, and extension of oil and gas companies going up to the Arctic and, of course, it has devastating environmental implications.